MySQL Workbench is a powerful, popular utility capable to administer, modify and backup MySQL databases. A healthy choice of features makes this software just as preferred by some admins and developers as for phpMyAdmin or HeidiSQL for others, especially with MySQL Workbench auto backup. As many other SQL administration utilities, MySQL Workbench is very good for general purposes related to MySQL managing, although some specialized operations, like MySQL automatic backup or manual filling, are still better performed by specialized software like Handy Backup. MySQL Workbench provides a complete set of functions and features related to manual MySQL administering and data managing. These features include schema control tools, visual model and object managing tools, database migration features and many other instruments expanding the basic toolkit. Basic MySQL Workbench backup and restore tool is a GUI built beyond the MySQL Enterprise Backup tool. It allows flexible task setup with encrypting, incrementing, fine-tuning datasets, making MySQL Workbench scheduled backup and manipulating with many other aspects of data saving. Handy Backup saves data copies preserving an original data format, unless other declared by a user. Therefore, "backups" created by Handy Backup are perfect copies of data ready to use just by a place where backups are kept, requiring no necessary restoration before using. Typically, MySQL data are not a single type of information used on some server. Much more frequently, these data are a part of more complicated structure, such as a dynamic part of website content. Handy Backup can back up all these data, and MySQL Workbench cannot. MySQL Workbench backup database feature provides only full and an incremental backup techniques, and Handy Backup completes this set by the more capable and advantageous (for databases) differential and mixed backup, as well as with automated versioning and time stamping. "So What I Must Select for My Purposes?" These advantages of dedicated MySQL backup software over the built-in MySQL Workbench backup can play a crucial role in a particular backup strategy developed just for some server or data center. Or else, when the role of these features is much smaller, then MySQL Workbench is for you. 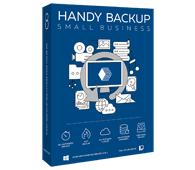 Handy Backup Small Business will help you easily back up and restore your MySQL databases. Try free for 30 days! For a convenience, let us briefly compare the capabilities of MySQL Workbench export and administering features with other popular tools for managing MySQL databases: phpMyAdmin and HeidiSQL. Here we define some pros and cons mentioned by many users of these solutions. A classic, solid and undemanding utility, phpMyAdmin has a lot of fans among MySQL users. Pros: The greatest pro for phpMyAdmin is a relative simplicity, allowing doing any operations with MySQL databases and tables quickly and effectively. Cons: A big problem of this software is a lack of any automation requiring performing any action with MySQL datasets (including regular activities such as backing up) strictly manually. More advanced and featured than phpMyAdmin, HeidiSQL software has some extra capabilities such as more powerful UI, data synchronization options and great user management system. Pros: HeidiSQL can manage some SQL engines other than MySQL. It has an intuitive GUI, many extra functions and a big choice of features managed by command-line parameters. Cons: As for phpMyAdmin solution, HeidiSQL lacks any automation of managing routines. For some functions of HeidiSQL, a redundance is reported. Almost a perfect tool, MySQL Workbench has all required capabilities for managing MySQL databases including an automation for some frequent activities. Moreover, it is expanding and changing constantly, meeting the requirements of newer and newer MySQL-related technologies. Pros: Simply, it is a great MySQL administering tool. The instruments of visualization for any MySQL database aspect (architecture, schema, objects etc.) make it even more attractive! Cons: The only problem of MySQL Workbench is a big consumption of system resources, making it uncomfortable to use on smaller or weaker machines, especially for backing up data. Therefore, we are recommending using MySQL Workbench for any MySQL daily administering tasks, and setting up a copy of Handy Backup along with it to perform backing up, cloning and replicating MySQL databases and tables in a fully automated mode, instead of using MySQL Workbench backup.